Looking for a USED SPMC-2040? Features：A powerful magnetic clamping tool to meet the demand of machining center and milling machine. Super permanent magnet chuck meet machining center, CNC milling ,such as high precision workpiece clamping and demand of shorten installation time, to fill the gaps in the powerful magnetic clamping tool of machine tool industry. Can significantly improve the efficiency, magnetic constant, uniform , predictable , simple and fast to replace the workpiece to achieve the five-sided machining, the workpiece can be beyond the work table, usually shorten more than 70%-80 % of auxiliary time. Powerful combination of magnetic force from the square-shaped magnetic pole, magnetic pole density distribution, magnetic field strength ,the internal stress in the workpiece can be released at the same time in processing to get high-precision workpiece. Magnetic force generated by the high performance magnetic materials, no time limits, no energy consumption, environmental protection , safety, operation is simple and practical. 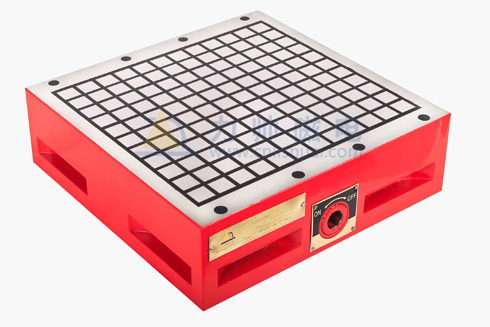 Zhejiang Lishuai Magnetic Co., Ltd. is a high-tech manufacturing enterprise, producing magnetic lifting tools with high starting point and profound industrial foundation. In our product development, we also have qualified staff to absorb the world's advanced technology. At the same time we are still continuing to absorb world-latest useful information and set up the scientific and complete products recearch and development system. We are specialized in producing Permanent Magnet Lifter (also called Permanent Magnet Loading Equipment, Permanent Magnetic Chuck) ,Automatic Permanent Magnet lifter, pemanent magnet electric sucker, powerful permanent magnet sucker,multifuctional permanent magnet worktable,permanent magnet rotary worktable and permanent magnet worktable.We have set up advanced quality-control system to make sure the high quality of every product. We are the leader in magnetic equipment industry. We have set up the enterprise aim of "Making the World-top Magnetic lifting equipment". With our belief of "Honest, Pragmatic and Mutual", we are dedicated to establishing the brand effect "Lishuai". Lishuai is always your partner.